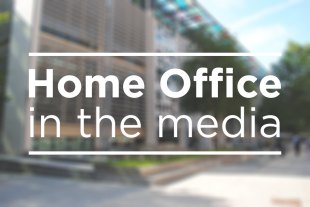 Today’s Home Office media stories include the National Audit Office report into how a Brexit no-deal could affect the UK border; there is also reporting on the so-called 'Beatles' fighters. There is widespread coverage of a National Audit Office (NAO) report which has found that there could be major disruption at the UK border if there is a no-deal Brexit. The report, which is the lead story for BBC Breakfast and the Today Programme, and is on the front of the Independent, has found that there could be queues, delays and a rise in criminal gang activity if the UK Government leaves the EU on poor terms. The Times reports that the NAO said ministers and civil servants had conceded it was too late to put in place a “fully functioning” no-deal border by the end of March. They added that businesses and individuals who relied on the border running smoothly “will pay the price”. In its reports the NAO said 11 out of 12 “critical systems” that need to be replaced or changed to manage a no-deal Brexit may not be ready in time. Extensive work to prepare for a no deal has been well underway for almost two years and we have robust plans in place to ensure the border continues to operate from the day we leave. Future IT systems and infrastructure are already being built and, as they do today, HMRC will continue to apply an automated, risk-based approach to customs checks. This means any increase in the number of checks will be kept to a minimum. We will always ensure we have the necessary resources to keep the border secure, and that’s why we’re recruiting approximately 600 Border Force officers to prepare for the day we leave the EU, in addition to the 300 officers which will be deployed by the end of the year. The Sun carries a brief report that says the Government has warned the US that it will be illegal for Britain to take back El Shafee Elsheikh and Alexanda Kotey – the two Daesh fighters, alleged to have been two of the four-man terrorist cell known as the ‘Beatles’. The piece quotes a Whitehall source as saying such a move would break international rules as they are no longer British citizens and it would therefore amount to rendition: a practice that is illegal across the EU whereby prisoners are moved between countries without any legal processes. It comes after a US Major General said the US wanted them returned to the UK.